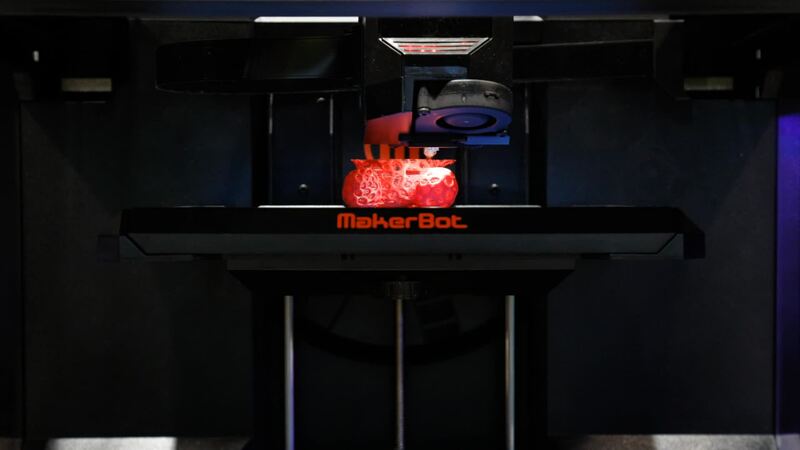 Equipped with 16 MakerBot Replicator 3D printers and an engraver/laser cutter, the mission of the Phyllis M. Taylor Maker Lab is to provide a space where students from all academic mediums are encouraged to collaborate, innovate, and create. Ideas come to life and learning is enhanced in this creative environment. The goal of this STREAM (Science, Technology, Religion, Engineering, Art, and Math) space is to foster creativity, critical thinking skills, project-based learning, and problem-solving so that regardless of the tools or technology, our learners will have the conceptual skills to be successful in their work. Mount Carmel Academy won a 2018 Innovation in Catholic Education Award for Technology Integration from Today's Catholic Teacher magazine for an interdisciplinary project among the 3D Animation, Acting, and Creative Writing classes. Creative Writing students and 3D Animation students brainstormed character concepts. Working together, they chose characters and discussed plot, perspective, and personality. The 3D Animation students used Tinkercad to create 3D models and then printed their characters on the Makerbot Replicators in the Phyllis M. Taylor Maker Lab. The writers used the 3D models as inspiration for crafting their screenplays. The animators created character puppets and backgrounds in Adobe Creative Cloud software and the voice actors used Character Animator to record voices and facial expressions. The students worked together to critique each element and offer feedback. The end result of this creative collaboration was a series of animated short films.